Recently, construction began on a nine-km tunnel across the Rohtang Pass at a height of nearly 4,000 m near Manali in Himachal Pradesh. The avowed aim of this tunnel is to provide an all-weather road to the tribal belt of Lahaul and Spiti, which remains cut off from the rest of the country for six months due to heavy snowfall. I would like to mention a lesser known but relevant fact. During the 1960s and 1970s, the state public works department and the General Reserve Engineer Force had built a metallic highway leading to the tribal area. It took these agencies 25 years and thousands of crores of rupees to complete this road, which became fully operational in the early 1980s. The upcoming tunnel could be avoided by building a tube shaped cemented highway on the existing metallic road, like the ones in the snow-bound areas in Europe. This will not only work out cheaper but also take half the time to complete. 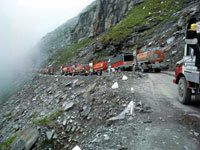 The tunnel, on the other hand, will dry up all the water bodies atop the Rohtang Pass and spoil the beauty of Manali. In the 1960s a similar tunnel built by the Bhakra Beas Management Board in the Sundernagar area had resulted in drying up of water bodies in a radius of 10 km. Dams and tunnels, the modern-day modes of progress, should be constructed only when there are no other options. Many a times, options do exist. It was interesting to read that 2,700 million units of electricity lost annually through appliances in standby mode (‘Turn it off’, July 1-15, 2010). But Forbes magazine mentioned that it was safe to keep them in the standby mode. Conservation isn’t always the overriding factor. When you are done using your computer, it might make more environmental sense to shut it down and not waste electricity. But every time you start a computer you are doing small amount of irrevocable damage as electrons surge through delicate circuits, flash-heating them, and causing expansion. Hard drives spin up from a dead stop to thousands of rotations a minute. Thus, shutting down and switching on the computer several times a day is a good way to quickly wear out your machine. Considering the nasty, ecologically unfriendly PC manufacturing process, the green thing to do is make do with the one you have for as long as possible. In the standby mode, modern PCs do not consume much power anyway. I intend to put forward a simple proposal for power generation. It shall have a bearing on rural employment and the urban poor apart from providing clean and green energy. We need to design pedalling stations of about 60 sq feet each and have about 1,000 pedalling points (modelled on the lines of stationary exercise bicycles used in health clubs). People could be employed at Rs 25-40 per hour to pedal, generating electricity. A meter would record the power generated. This shall convert the liability (using it in economic terms) of unskilled population into an asset overnight. The energy generated will be clean and the investment, minuscule. We could also aim for carbon credits and most importantly the money shall directly go to the people. We could also utilise funds allocated for rural employment guarantee schemes for this. The common man never gets justice. In case of the Bhopal gas tragedy, even after decades the real culprit is absconding, allegedly with help from our own politicians (‘25 years too late’, July 1-15, 2010). It is a sad fact of Indian democracy that even after public outrage and hue and cry in the media, politicians are never found guilty of any charges— minor or serious. No one comes to know the truth because evidence never reaches the courts; the netas are acquitted because money and power play a major role in these cases. I welcome the move by the government to double afforestation in wastelands in 10 years (‘Green Mission: raise forests, sink CO2’, June 16-30, 2010). As per the draft ‘Green India Mission’, the Centre’s climate change action plan, with a budget allocation of Rs 44,000 crore, the project aims to sink 43 million tonnes of CO2 every year. But that will happen only if the trees survive up to the age of five years, the most vulnerable period. This is the lacuna in most of the projects launched to green India. If the plantings fail in the first year, trees should be replanted in the second year and nursed with extra care to make sure they survive. 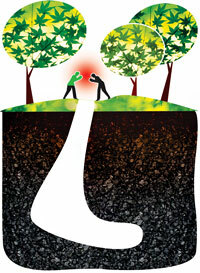 Now, when plantations fail, those in charge abandon them and move on to greening other patches. They come back to the abandoned patch after a decade under a new project and new funding. This must stop. No afforestation can sink CO2 without the survival of targeted trees. It is unfortunate that the coal and power ministries are fighting the ministry of environment and forests over mining in dense forest areas (‘Tussle over coal blocks in forests,’ June 16-30, 2010). Why is the government so keen to mine the 35 per cent coal reserves in dense forest areas, classified out of bound for mining by the environment ministry, when it is not able to control loot and illegal mining in the rest of the mining zones? If the existing mining areas are managed properly, I am sure the government would not have to destroy forests to meet its growth targets. Child labour and appalling working conditions in the mines also need to be looked into. The proposed amendment to the mining act should take these aspects into consideration. And we should have a mining policy that brings prosperity to the people as well as better earning to the government. Sanitation in India is alarmingly poor both in terms of coverage and quality (‘Sanitation survey has no winners’, June 1-15, 2010). For better quality of life, access to sanitation has to improve. The government’s total sanitation campaign, which is restricted to rural areas, should be diversified to urban areas. To make the campaign a success, the most significant resource, water, will have to be made available. This is more challenging in the coastal saline environment. Apropos the article ‘The iron bar’ (July 1-15, 2010), fluoride contamination in groundwater is a common problem in semi-arid climatic zones like Rajasthan, Karnataka and Andhra Pradesh. These places have 15 mg/litre fluoride in the groundwater. Fluoride concentration in drinking water prescribed safe by the World Health Organization is 1.5 mg/l. Granite is the main source of fluoride in groundwater in these states. The groundwater resides over long periods of time (over 5,000 to 10,000 years) in these hard rock aquifers and that is how the fluoride gets into the water. The natural remedy for this is flushing the aquifers with freshwater (rainwater that infiltrates into the aquifers). But these areas receive very low rainfall. Another natural remedy is to use locally available food items. We conducted experiments (as a part of a PhD thesis) to remove fluoride from groundwater using food items like tamarind seeds, drumstick, tomatoes and amla (emblica officinalis). We treated groundwater in Hungund-Ilka area in Bagalkot district of Karnataka which contained 7 mg/l of fluoride with dried tamarind seed powder. The tamarind seed powder absorbed fluoride ions and reduced its concentration to 5 mg/l. This shows the problem has to be tackled through multidisciplinary approach—not just by physicians, earth scientists and environmental engineers. The research can be taken up in the field of bio-gechemistry as already being done in other countries. Last year we got an anti-termite treatment done in our house in Noida near Delhi, and this year I notice new-born lizards dying in large numbers. The cockroach population has gone down drastically and earthworms and other crawlies are not to be seen any more. How can we deal with termites in a manner that spares other insects? Please throw some light on domestic ecology in urban areas.